A couple of years ago I fell asleep in an awkward angle in which my entire right leg "fell asleep". When I woke up, the feeling returned with pins and needles, but I was no longer able to stretch my little toe away from the foot. Fast forward until about 6 months ago, and I started experiencing a lot of pain on the top of my right foot. Sometimes it is tingly, and sometimes it is just a constant pain that gets worse after driving or standing for long periods of time. I have noticed that on occasion when walking, I will get a severe pain followed by a cracking sound in the top middle part of my foot. The severe pain goes away after the crack although my foot is always in pain now. It can sometimes even wake me up in the middle of the night. I have also discovered recently that the paralysis of my little toe seems to have expanded, so I can no longer stretch any of my toes other than my big and 2nd toes. The space between them has gotten much bigger, and there is noticeable difference between the shape of both feet. The top of my right foot is sometimes numb, feeling like the nerve damage in my shoulder. There are no podiatrists in my small town, so I was hoping you might be able to advise me what I can suggest to my family doctor the next time I'm in, or even if there is something I can try from home. I think you may have two independent problems going on here even though they are both occurring on your right foot. sort of neurological condition. It may also be age related, but I do not know how old you are. If you are in your sixties or older it could just be part of the "aging process". I think the inability to spread your toes and the worsening of those symptoms would be best evaluated by a neurologist. As far as the pain, tingling, numbness on top of your right foot goes, I may have an answer for you. Read my section on midtarsal fault. Your symptoms sound like a classic example. Notice the blue arrow on the enclosed diagram. That is the midtarsal area of your foot. If your doctor takes an x-ray, have he or she look at the lateral view. 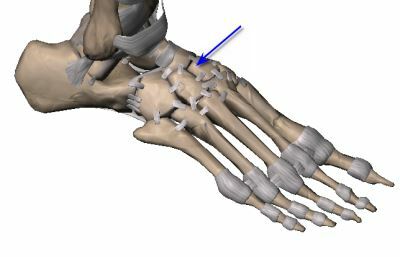 If there is excessive bone spurring on the tops of the bones in the midtarsal area, then it can be safe to say that your have arthritic changes going on in this portion of the foot. The significance of this is the fact that the bone spurs, put pressure on the sensory nerves that pass along the top of the foot. When these nerves are irritated by the bones, particularly when you have on closed shoes, you will experience, burning, tingling, numbness on top of your foot in that area. Now, if you happen to be moderately to severely pronated, (your foot flattens out excessively when you stand up) the bones in the midtarsal area on top of your foot will jam together and will cause pain. It will be worse when barefoot or in flimsy shoes like flats and should feel a little better in shoes like sneakers. As you will read in the article "midtarsal fault", the easiest thing to try is an arch support to keep your foot from over flattening out. A cortisone injection into the area may also prove to be beneficial. This is where I would start in an effort to figuring out what is causing the pain in your right foot.